Bristol City will break the 100-point barrier if they win all three remaining games. The away side dominated from the start, with James Tavernier's toe-poke and Joe Bryan's far-post header putting them in command at the break. Tavernier's slotted finish and Aaron Wilbraham's strike completed a memorable evening. 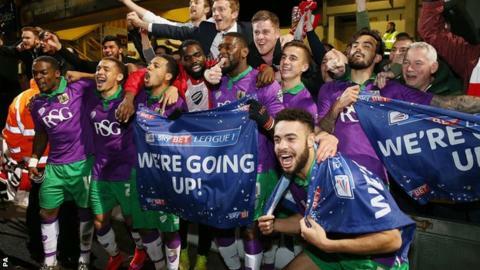 Having lifted the Johnstone's Paint Trophy at Wembley last month, Bristol City's latest undefeated run in the league stretches 12 matches and leaves them strong favourites to complete a lower-league double. The former Cheltenham, Burnley and Portsmouth manager's summer recruitment has been key to their success, with the arrival of Luke Freeman from Stevenage as significant as any. Already the division's leading assist maker, the 23-year-old was again the orchestrator as the visitors bossed the opening period, setting Tavernier clear for their first and crossing for Bryan to head in the second. Ayling's 25-yard strike sneaked in past goalkeeper Ben Williams for their third, before centre-half Flint headed his 11th of the campaign from Marlon Pack's free-kick. Tavernier grabbed his second soon after, bundling in at the far post, and Wilbraham capitalised on a defensive mix-up to slot past Williams and send the Robins up with three games to spare. Match ends, Bradford City 0, Bristol City 6. Second Half ends, Bradford City 0, Bristol City 6. Christopher Routis (Bradford City) hits the left post with a right footed shot from outside the box. Substitution, Bristol City. Jay Emmanuel-Thomas replaces Aaron Wilbraham. Foul by George Saville (Bristol City). Jon Stead (Bradford City) wins a free kick in the attacking half. George Saville (Bristol City) is shown the yellow card. Gary Liddle (Bradford City) wins a free kick in the defensive half. Attempt missed. George Saville (Bristol City) left footed shot from outside the box is too high. Substitution, Bristol City. George Saville replaces Luke Freeman. Goal! Bradford City 0, Bristol City 6. Aaron Wilbraham (Bristol City) left footed shot from the centre of the box to the bottom right corner. Substitution, Bristol City. Greg Cunningham replaces Joe Bryan. Substitution, Bradford City. Tony McMahon replaces Filipe Morais. Substitution, Bradford City. Christopher Routis replaces Billy Knott. Goal! Bradford City 0, Bristol City 5. James Tavernier (Bristol City) left footed shot from the centre of the box to the bottom left corner. Corner, Bristol City. Conceded by Gary Mackenzie. Attempt saved. Kieran Agard (Bristol City) right footed shot from outside the box is saved in the top right corner. Attempt missed. Marlon Pack (Bristol City) right footed shot from outside the box is high and wide to the left. Gary Liddle (Bradford City) wins a free kick on the right wing. Goal! Bradford City 0, Bristol City 4. Aden Flint (Bristol City) header from very close range to the bottom left corner. Assisted by Marlon Pack with a cross following a set piece situation. Foul by Gary Mackenzie (Bradford City). Aden Flint (Bristol City) wins a free kick in the defensive half. Foul by Jon Stead (Bradford City). Attempt missed. James Hanson (Bradford City) header from the centre of the box is too high following a corner. Corner, Bradford City. Conceded by Joe Bryan. Goal! Bradford City 0, Bristol City 3. Luke Ayling (Bristol City) right footed shot from outside the box to the centre of the goal. Attempt missed. Jon Stead (Bradford City) left footed shot from the centre of the box misses to the left. Marlon Pack (Bristol City) wins a free kick on the left wing. Second Half begins Bradford City 0, Bristol City 2. Substitution, Bradford City. Jon Stead replaces Mark Yeates. First Half ends, Bradford City 0, Bristol City 2. Attempt missed. Gary Liddle (Bradford City) right footed shot from outside the box is close, but misses the top right corner. Attempt saved. Kieran Agard (Bristol City) right footed shot from the left side of the box is saved in the bottom right corner. James Tavernier (Bristol City) wins a free kick on the left wing.